Defenders: The Best Defense #1 Review – AiPT! It has all been building to this (and by “all” I mean the four one-shot stories that came before this issue). 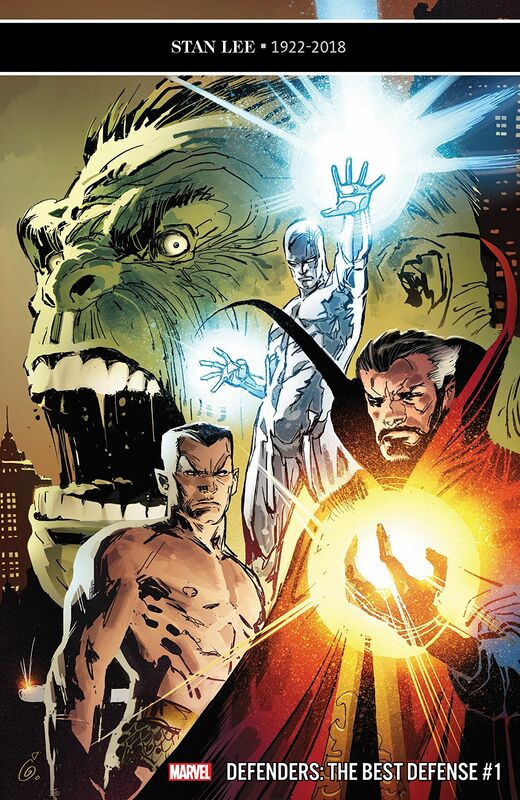 Doctor Strange, Hulk, Silver Surfer, and Namor must save Earth. What else is new? The creative team behind the excellent Immortal Hulk join forces to save the universe along with our newly minted Defenders. Well, they aren’t calling themselves that yet, but you get the picture. This is a cosmic story with awesome proportions. This issue opens with a cosmic entity using what looks like glass blowing equipment to toss planets into what is dubbed The Train. It’s a cosmic force not unlike Galactus that seemingly burns up entire planets so as to fuel itself. What its purpose isn’t clear, but what is clear is that Earth is on course for its next meal. Like a giant cosmic whale, this entity fueling the furnace has a parasite messing with it, who happens to know Silver Surfer. So begins the journey to save Earth, which requires the efforts of all three heroes who had one-shot stories in the last two weeks. It’s a big, Kirby style cosmic story that’s as wacky as it is intense. I wasn’t sure how this story would integrate each hero, but by the end, it’s safe to say they were integrated logically and well timed. Doctor Strange is actually a version of the character from a dimension where all is lost, but all the other characters are from the main timeline. As they weave in and out of the story Hell is involved, the dealing of souls, Atlantis comes under parrel, and Silver Surfer’s board is used as a weapon by the Hulk. Long story short, it’s an intense ride with each character playing a key part in saving Earth. Joe Bennett draws this issue and the work here is so different from Hulk you might not notice it’s the same guy. Hulk is all about the finer details, but here Bennett must pull back and show us things larger than a solar system. Bennett accomplishes the feat of making gigantic beings understandable, and yet scientifically impossible. There’s a lot of wonderment afoot here and it’s impressive. Each hero gets a closer inspection in the story and Bennett makes sure to tap into their emotions giving them quieter beats in the story while everything seems to be exploding around them. You really should have that looked at. The art can look a bit rough around the edges at times. Bennett must have been strapped for time when drawing this since it’s not quite as sharp as his work on Immortal Hulk. It’s mostly great, but there are pages where it looks a bit rushed and less defined. There are a few pages where it appears he’s simply turned the panels to add a bit of dynamic flair, but it doesn’t always work. In fact, one or two looks like the panels got shifted by accident they are turned so ineffectively. This issue serves as a promise for more Defender action. The heroes themselves must admit by the end they work well together even if they aren’t technically a team, yet. This is a cosmic tale with huge stakes and an even bigger scope. It’s a story only comics could pull off and Ewing and Bennett do so smashingly. This issue serves as a promise for more Defenders action. The heroes themselves must admit by the end they work well together even if they aren’t technically a team, yet. This is a cosmic tale with huge stakes and an even bigger scope. It’s a story only comics could pull off and Ewing and Bennett do so smashingly.